Let’s face it; we were all scared of the dark at some point in our lives. By using a night light, you can keep your child’s room illuminated while scaring the monsters away. Night lights are great because they’re not so bright as to disturb your baby or toddler when they’re sleeping. What’s more, these night lights are not only for our child’s well-being, but also us as parents. When attending to your children, it’s common to stumble and fall over objects scattered on the ground. Nowadays, night lights can be very versatile and come packed full of features. They’ll also leave you wondering what you ever did without them. Here are some of my favorites. 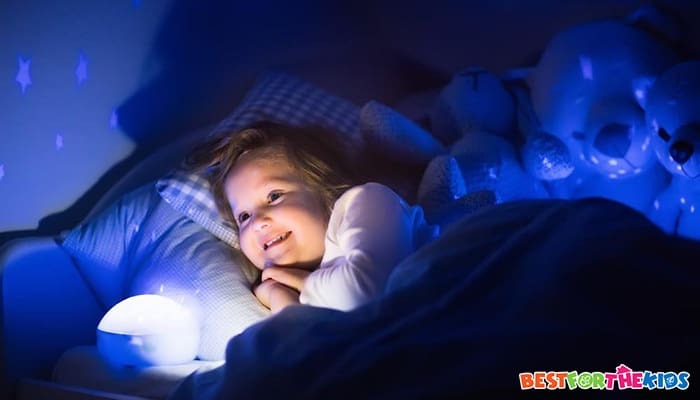 When choosing the right night light for your child, it’s easy to get overwhelmed. Even searching ‘night light’ on Google returns over 21 million results. I’ve done the hard work for you, allowing you to pick a suitable night lamp out of some of the best. What Are the Benefits of Using a Night Light? How are Night Lights Powered? 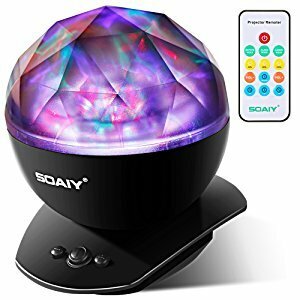 How Easy to Use Are Night Lights? How Do I Change the Bulbs in My Night Light? To start off my list, I’ve chosen one of my absolute favorite night lights. This device doesn’t just create star patterns; it can also create soft glowing environments. You can project vibrant colors or generate your own Northern Lights display. For lighter sleepers, I recommend using the soft mood lighting instead of the intense light shows. It is great that you have the choice of which setting works best for you. One of my favorite features is the comprehensive remote control. The buttons are clearly labeled and easy to use, and it allows you to adjust all of the settings, such as the timer. You can also change the type of light display with a click of a button. It’s worth noting that you won’t be able to use the remote if you’re not in the same room. However, nothing is stopping you from poking your head around the door to change the setting. What's Great About It: A feature that you won’t find anywhere else is the integrated ability to play music through the device. You can achieve this using a USB cable and your chosen audio device. You could play calming sleep induction music or even pre-recorded sleep stories. 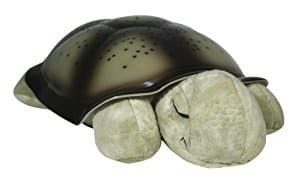 The Lizber Night Light was easily one of my personal favorites. This model is not so much a night light, but more of an advanced, child-friendly projector that brings the entire galaxy to your child’s room. 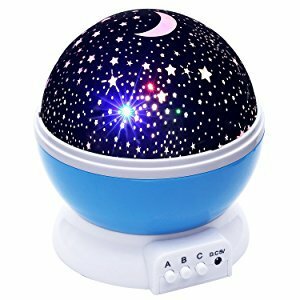 At the push of a button, you can easily project hundreds of stars onto your child’s walls and ceiling. In fact, there are three diverse settings to choose from. The first setting streams a steady beam of stars, perfect for a motionless night sky vista. The second setting gently flickers and fades the lights, beaming up a multitude of vibrant colors. The last setting slowly rotates the device, giving your child their own starry light show. All the controls on this model are incredibly easy to learn and use, and you’re guaranteed to pick it up in no time at all. The displays are beautiful, and it’s even suitable for enchanting children as they get older. One of the best features is the fact that you can customize the colors the show uses. This means you can find the perfect setting for your child to fall asleep to. What's Great About It: My favorite feature of this unique constellation-creator is its wireless ability. It means you can position the device anywhere in a room or in any room of the house. It doesn’t matter whether you have a mains outlet there or not. With portability in mind, this device runs off three AAA batteries. This allows you to position this night light wherever you think is best, and you won’t have to worry about there being a mains outlet. There are multiple designs and colors available that make this night light a very personal experience for your child. There is even an included story book and an adoption certificate. This is to increase the bond between your child and the night light. What's Great About It: One of the highlight features of this device is the fact that it runs on a 45-minute timer. This means the device will automatically shut off after this time. This is to save battery while minimizing the risk of waking your child during the night. Note that the device can only run on this setting and it won’t stay on all night. More in Baby Products: What are the Best Portable Travel Cribs? When it comes to night lights, parents tend to have a lot of questions. These include what they should be looking for when making this important decision. To save you the trouble of looking, I’ve answered some of the most important questions to get you on your way. Both parent and child can benefit from using a night light. As a parent, you’ll be all too familiar with your baby rarely sleeping for the entire duration of the night. This is a very common issue in the first few months of life. As a parent, you’ll be checking and attending to your baby throughout the night to make sure that they’re okay and safe. Traditionally, you may check on your baby by turning on an overhead light. This grants you safe passage as you move throughout the room. However, turning on the light can startle your child. Typically, this will result in a crying, wide-awake child. Using a night light eliminates this problem. You can also check your baby’s position and safety as they sleep without disturbing them. As you can see, night lights provide your baby with a very soothing environment for them to sleep. Gently dancing lights and beautiful patterns will soon send your baby drifting off to dreamland. With the additional ability to play sounds, sleep will usually come in a matter of minutes. The best way to think of this is that your night light is a giant toy model that would hang above your child’s bed. Instead, in this case, it’s projected across your child’s ceiling and walls. There are two types of powered night lights to choose from. These are outlet powered or battery operated. There are pros and cons to both, so it’s up to you which one is best for your household. With a mains-outlet powered device, you’ll simply have to place it into the outlet and turn on the plug. Some of these devices come with light sensors, so they will automatically turn off as the sun rises. However, these devices typically take a lot more power, and you may see a spike in your energy bills. 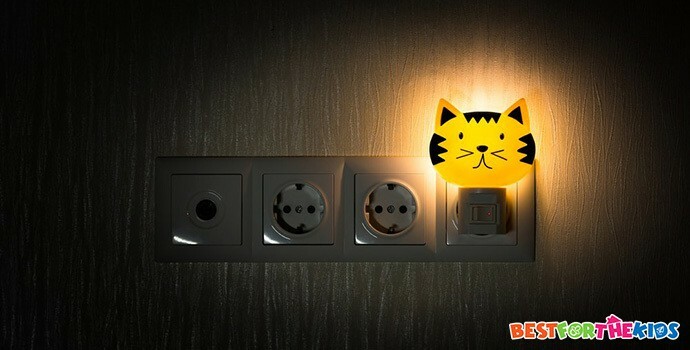 Alternatively, you can opt for a battery-powered night light. These are easily the most popular types of night light as there are countless benefits. These devices are powered using disposable or rechargeable batteries. This ensures you only use the amount of power that you need. This can vary from model to model, and brand to brand. Some night lights come with a lot of unique features, and it may initially seem complicated to use. This is essential to get right as a complicated device will cause a lot of hassle. For example, if you’re trying to turn it on or off in the dark. Like my devices listed above, most companies have made it easy to use these night lights. Most devices will use simple buttons or a labeled remote control. It’s advised that you become familiar with the controls before you use it throughout the night. This is a great question that usually stumps most parents. However, it’s incredibly easy once you know how. You need to check the manufacturer’s instructions or check the bulb that’s currently in your device. You may find that your device is using a colored bulb. Studies show that blue bulbs are renowned for hampering sleep whereas red bulbs help to promote sleep. Bear this in mind when choosing your bulb. There are some great night lights available out there, as they are some terrible ones. Consider what you want from your night light, and the final decision will be effortless.